Offer valid on purchases from 03/20/19 to 04/18/19. Form must be postmarked or received by 05/18/19. For more information about this promotion, please call 1-866-212-9619. To learn more, please call 1-800-MICHELIN or visit MichelinMan.com for participating dealers. Not valid with any other offer. See offer terms and conditions for further details. * Offer valid for residents of the United States only who purchase from a participating dealer located in the fifty (50) United States, District of Columbia and U.S. territories (Puerto Rico, Guam and U.S. Virgin Islands) (the “U.S.”). Purchase must be completed between 03/20/2019 and 04/18/2019. Limit of one (1) redemption request ($70 Mastercard® Reward Card) per purchase of four (4) new MICHELIN® passenger or light truck tires. Limit of three (3) redemptions per household. Must be at least 18 years of age or older at the time of purchase to be eligible. All requests must be postmarked or received by 05/18/2019. Please allow four (4) to six (6) weeks for delivery of the $70 Mastercard® Reward Card via mail. Sales to Original Equipment manufacturers, fleets, wholesalers and business accounts and purchases for resale are not eligible for this promotion. Original Equipment tires DO NOT qualify. Purchases from warehouse clubs (e.g., Sam’s Club, BJ’s, Costco), mass merchandisers and national retailers (e.g., Discount Tire, Tire Kingdom, NTB, Merchant’s, Tire America, Midas, Monro, Big O) are excluded from this promotion, but may be eligible for coverage under a store-specific promotion (see individual store[s] for details). In addition, purchases from any nonparticipating dealers are not eligible for this promotion. Tampering with, altering or falsifying purchase information constitutes fraud. All decisions made by Michelin (or its authorized representatives) relating to the validity of any submissions are final and binding. This promotion is subject to all federal, state and local laws and regulations. 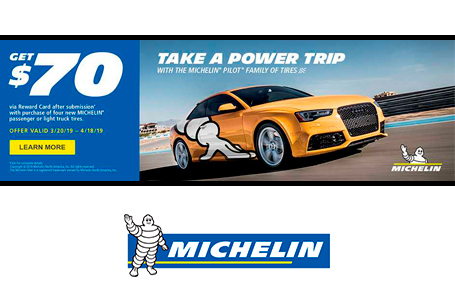 Michelin reserves the right to modify or discontinue this offer, products and/or services at any time for any reason. No cash refunds. Please retain copies of the materials you submit. All requests become the property of Michelin North America, Inc., and will not be returned. Michelin is not responsible for any lost, late, stolen, damaged, misdirected, incomplete, incorrect or illegible mail. No postage-due requests. For questions regarding this promotion, please call 1-866-212-9619 Monday through Friday between 8:00 a.m. and 8:00 p.m. ET. Please reference the 2019 Michelin Spring Promotion when calling. Offer may not be assigned, traded, sold or combined with any other Michelin offer. THIS OFFER IS NOT VALID WHERE PROHIBITED OR RESTRICTED BY LAW. The Reward Card cannot be reloaded with additional funds, nor can it be used at an ATM. Reward Card expires six (6) months after issuance. No cash access. Fees apply. For complete terms, conditions and fees, see the Cardholder Agreement in your card package. Reward Card issued by U.S. Bank National Association pursuant to a license from Mastercard International Incorporated. Mastercard is a registered trademark of Mastercard International Incorporated. Quality products from Michelin®, BFGoodrich®, and Uniroyal® and great service set Brody's ACCC apart from the rest. Our service department specializes in alignments, brakes, and tire repair for customers just like you.